No matter what your favourite social network is, what games you play most often and whether or not you’re regularly checking your weather app, there’s something all of us need from a smartphone – an alarm app. 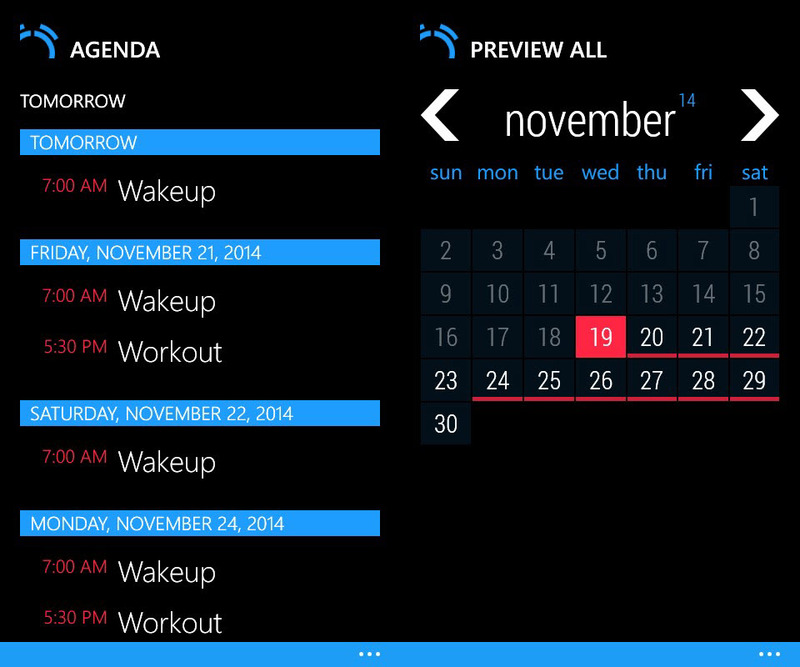 Windows Phone comes with a decent, default alarm app – especially appreciated by those who need very little from it. It’s clean, simple and it does the job right? If you want a more advanced alarm app, you’ve probably ditched the built-in one ages ago or at least thinking about it. 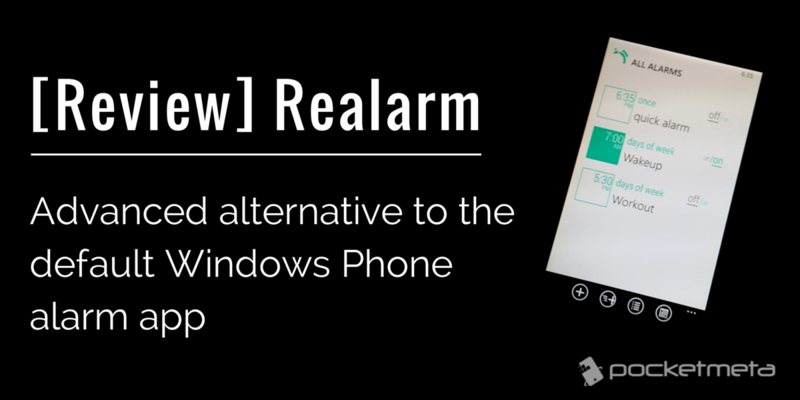 Realarm is a full-featured alarm app for Windows Phone that is miles ahead compared to the one that comes packed into the OS. Its incredibly extensive customization options can surely please even the most finicky users. see your alarms in a calendar – just tap on the date you want to see all your alarms for that day. Once you expand the control bar you also get shortcuts to the app’s settings menu, live tile options, voice commands, rate the app and about page. 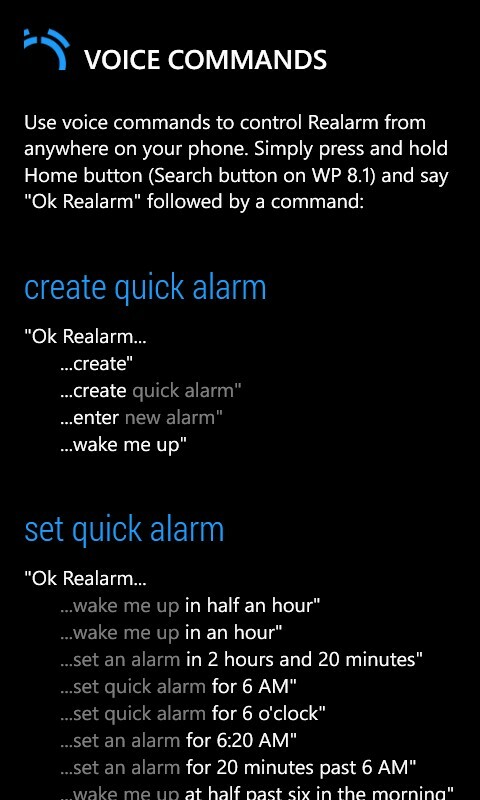 Realarm gives you two choices when creating new alarms. If you need a customizable alarm with all of the app’s related settings you’re going to use its “add” option. Here you can personalize every aspect of your alarm exactly. This involves choosing a name for it, the start time, recurrence (here you’ll get incredibly extensive options from once and on a minute basis up to monthly and custom – where you can set specific dates), repeat pattern and sound (you can choose more than one and it will randomly switch between them). On the other side, we have the quick alarms. If you need a simple reminder within the near future (up to 11 hours 59 minutes in advance), this is the option you’ll want to choose. All you can do is set after how much time the alarm should go off. Unlike the regular alarms, quick alarms are automatically deleted one day after they expire – this is the default setting which you can change anytime. This way your alarm list stays clean and only populated with relevant entries. Realarm doesn’t try to be a time planner but it can come in handy to see all active alarms for each day listed as an agenda layout. It offers a clear, overall view of your alarms so you can quickly become aware if you need to add more or edit existing ones. You can also see your alarms in a calendar. Only highlighted days have active alarms and taping on any of those dates displays them in a list. The settings menu lets you change the app theme and there are 5 to choose from, unless you want to match it with your system theme. From this section you can also choose to show/hide the system tray, create a preset list of alarm sounds that will be added by default to any new alarm you create, round minutes to 5 (if you disable it you’ll be able to set alarms to the minute), change the start of week, configure auto-removal of expired quick alarms and more. 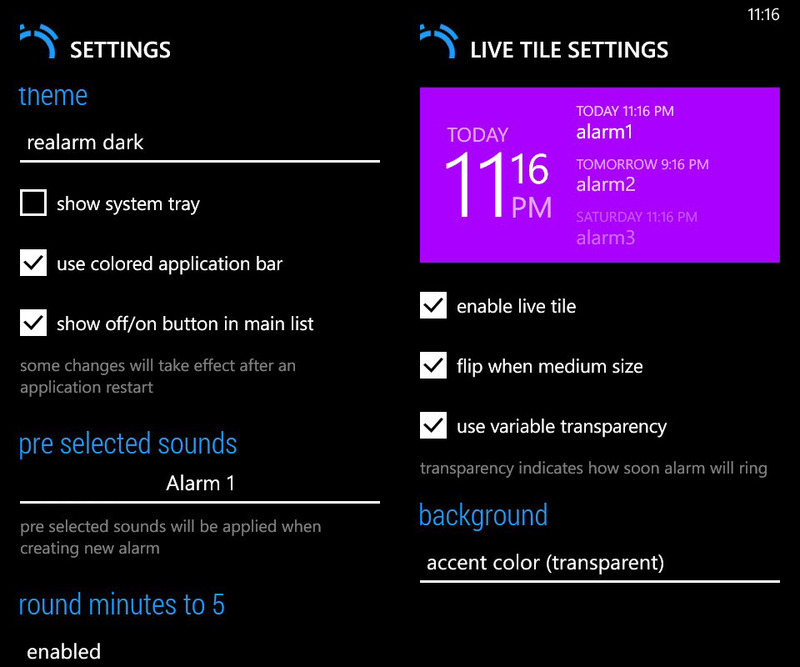 Obviously Realarm comes with live tile support and from the dedicated menu you can customize it to your liking. The live tile can have variable transparency and a custom background that can be one or more images from Realarm’s background collection, the entire collection, the accent color or a custom color. You can also enable/disable tile flipping when it’s of medium size. If you’re not a fan of live tiles, or simply don’t need to use this feature with Realarm you can disable live tile – in fact it’s the first option. This way the tile will show only Realarm’s logo and won’t display other information on your alarms. Realarm can also be controlled via voice commands. The voice commands section offers all the commands you can use with the app. To use voice commands all you have to do is press and hold the Home button or Search button if your device is running WP 8.1 and say the command. The format is “Ok Realarm [insertcommandnamehere]”. You can create quick alarms in various ways using your voice. For example you can tell Realarm to set a quick alarm for a specific hour or within a certain period of time. Through voice commands you can also mute all alarms for a certain amount of time as well as unmute them. I tried some of them, and they all worked flawlessly. If you’re the “less typing, more talking” kind of user, you’ll certainly like this feature. To be honest, after testing Realarm I decided to keep it. The default Windows Phone alarm app, pales in comparison. Realarm is incredibly versatile – the app gives you a basic quick alarm if you need a simple reminder while you’re on the go, but at the same time it provides in-depth customization of your alarms with some truly powerful recurrence options. The only thing I feel is lacking from the app, is the ability to use your own songs as alarm sounds. I couldn’t blame it on the app though, since this limitation is imposed by the system itself. 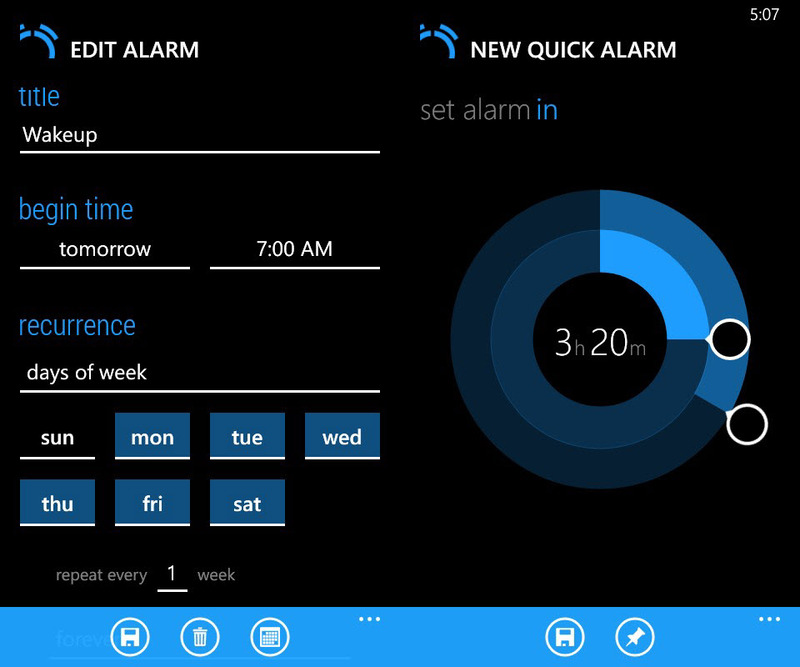 Do you use Realarm as your main alarm app on Windows Phone or maybe you found a better alternative? Let us know in the comments section! Follow us on Pinterest and Google+ for the latest on apps & game reviews, news, tips and how tos for Android, iOS and Windows Phone (and feel free to Pin this article so that you’re easily able to reference it later).